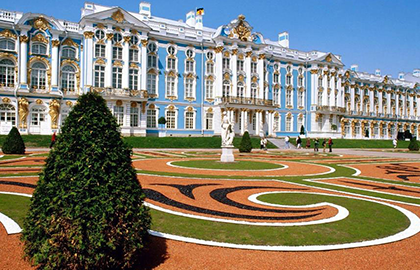 During the tour «Pushkin (Tsarskoye Selo)» you will be able to see the state rooms and chambers of the great emperors of Russia, as well as the famous Amber room, restored to the 300th anniversary of St. Petersburg. It is known that in addition to some fragments, all the elegant decoration of the hall disappeared without a trace. It was taken out of Russia by officers of the German troops, but later could not find it. Therefore, you will see the restored Amber room. However, what the restorers have done is amazing. For more than ten years, this hall has been admired by tourists from all over the world, who arrived on a tour to Pushkin. You will also have a walk through the alleys of the picturesque Catherine Park. You will be able to appreciate this beautiful monument of world landscape art of the 18-20 centuries.